The harmonica is a quintessential blues and rock instrument. This seemingly simple instrument takes years to properly master. Once you have mastered the harmonica, you will definitely want a harmonica holder so you can play the guitar and the harmonica at the same time or in alternation. I have selected some of the best harmonica holders that can take your jamming to another level. 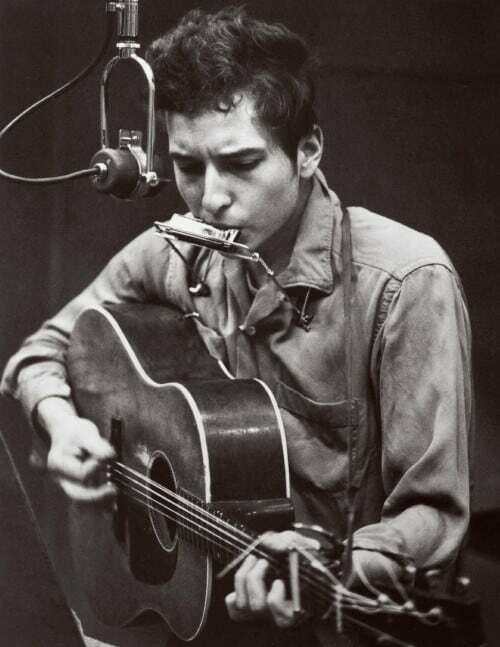 Dylan popularized the harmonica holder in the 60s, but you can also pretend to be Bruce Springsteen, Sheryl Crow, or Neil Young, if you will. There isn’t a holder that fits all musicians. So feel free to explore the options on my list and find just the right one for you. What is a Harmonica Holder? How to Properly Position a Harmonica Holder? This harmonica holder comes from the famous virtuoso Lee Oskar. He has been producing harmonicas and accessories since the 80’s and today his eponymous brand is a top name in the business. The qualities that definitely go in favor of this harmonica holder are excellent fit and build quality. The all-metal Lee Oskar harmonica holder is designed and constructed to securely contour around your neck so there is almost no risk of slipping. All things considered, the price is affordable as well. However, I should point out that some people might find it a bit challenging to find the perfect positioning for this holder. This probably has little to do with the holder itself but rather because each individual has a different body type. Either way, the Lee Oskar model is fully adjustable. With a little tweaking and some practice, this great tool can be perfectly positioned to fit any musician. And let’s not forget the fact that the LO10HH is designed to fit 10-hole harmonicas. The Hohner HH01 is probably the one that gives you the best value for money. This particular model is among the most popular for good reason. It features an all-metal frame that is enhanced by a rubberized brace for the neck which provides some extra comfort especially after hours of jamming. Another thing that I really like about the HH01 is the wingnuts. These nuts allow the player to find the perfect harmonica position to ensure smooth play and no slipping. This brings us to the one thing that some players might not like about the Hohner HH01. To be more precise, the HH01 is quite a tall harmonica holder which might not be to everybody’s taste. But as we previously mentioned, every harmonica player is unique so you should test it out before passing any judgments. The HH01 is also designed to accommodate the standard 10-hole harp. If there is such a thing as the ultimate harmonica holder, the Hohner MZ 2010 is probably it. This holder stands out for its exquisite build quality, unparalleled adjustability, and excellent design. 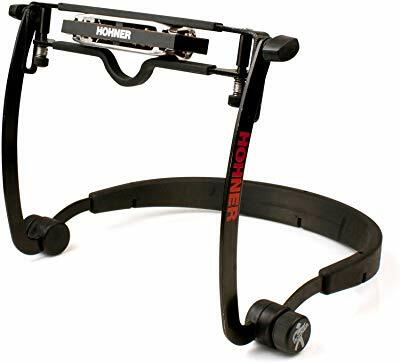 The Hohner features a cool black finish and thick rubberized neck support. In addition, the adjustment nuts are extremely reliable and allow you to easily find the optimal positioning. I should also mention that the neck support or rack is slightly curved to provide some additional comfort. It is designed to fit the standard 10-hole harps, but it can also accommodate larger harmonicas which delivers some extra flexibility. These ultimate features come at a premium price. Nevertheless, it is well worth the price especially for professional players. It can provide years of carefree jamming in light of its excellent adjustability and build quality. 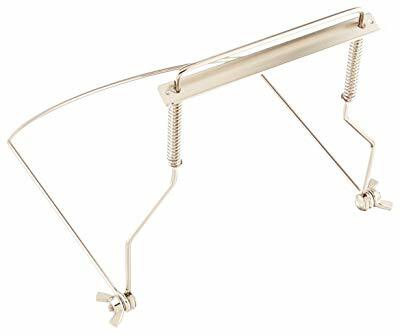 Instead of going around your neck, the HarpArm attaches to a boom or mic stand and thus puts less stress on your upper body. It doesn’t feature a clamping mechanism either. There are secure rare-earth magnets that grip your harmonica tightly and keep it in place. I should point out that the magnets are not too strong which allows easy harmonica changes during your jam sessions. 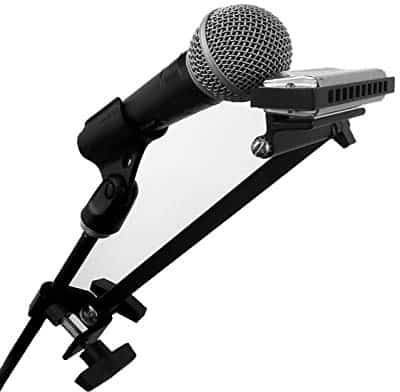 In addition, the HarpArm holder has a convenient attachment mechanism that can fit most standard mic stands or boom arms. The thing that I particularly like about the mechanism is that it offers three different adjustment options. This gives some extra flexibility to the entire system and provides perfect positioning of the instrument. There are a few things that you need to understand before deciding on a suitable harmonica holder for you. The following guidelines should help you make an educated purchase. 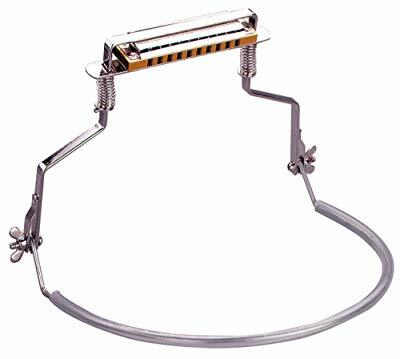 A harmonica holder, or neck rack, is a metal device that clamps the instrument and keeps it around a musician’s neck. It is usually made of metal with a spring mechanism that holds the harmonica between two brackets. There is a curved metal loop which supports the holder on the players’ shoulders. It is interesting to mention that some of the first harmonica holders were made from coat hangers or simple wire. This isn’t surprising for they were modeled after DIY harmonica holders. Like everything else, manufacturing technology has moved far ahead and there are some quite sophisticated models nowadays. The musicians who popularized this accessory include the likes of Neil Young, Bob Dylan, and Bruce Springsteen, to name a few. Harmonica holders usually slip around the neck. Once the holder is around your neck, move the instrument to your mouth and tighten the wingnuts. The harmonica itself is usually held by a spring-loaded mechanism and you can position it first before slipping the holder around the neck. I should point out that properly tightening the wingnuts is crucial or the instrument might slip away. This is why it would be wise to spend more money on a holder that’s equipped with strong nuts. Using a harmonica holder frees your hands for another instrument. The most usual combination is a harmonica around the neck and a guitar in one’s hands. However, developing the technique needed to coordinate the two is quite a challenge. 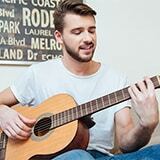 My top advice would be to start slow and practice the parts where there is no instrument coordination. It also pays to have both instruments tuned to the same key. For example, if you have a C harmonica tune your guitar to C.
With some practice and the right tools, your jam sessions can get to the next level with the addition of a harmonica holder. My selection of the best ​options should help you pick out just the right one for you. Once you make your choice, the fun part is mastering the necessary harmonica-guitar coordination to nail your blues.